2007 Office System Document: Object Model Posters Download these files to view object model posters for products and technologies relating to the Microsoft Office 2007System. Diagnosing SQL Server performance issues using sp_lock DBAs can effectively diagnose database locking issues by using the SQL Server sp_lock system stored procedure. Demo: SQL Server 2005 High-Availability Capabilities Microsoft's demo focuses on the high-availability capabilities of Microsoft SQL Server 2005 and how it enables organizations to do more with less by delivering a data management and analysis solution that is dependable, productive, and economical. With this update to the Microsoft Office InfoPath 2003 Toolkit for Visual Studio 2005 as included in Microsoft Visual Studio 2005 for the Microsoft Office System, you can develop InfoPath 2007 forms inside Visual Studio. Developing Solutions Using the Consolidated Outlook 2007 Object Model Learn about new platform features in Microsoft Office Outlook 2007: an overview of the unification, security, performance, and forms improvements in this release. Building Custom Solutions with Excel Services Excel Services let users calculate, display and explore Excel workbooks on the server side. Learn the reasons behind Excel Services, the benefits, and see a demo using a Web service to incorporate Excel-based business logic into your own server solutions. Microsoft Office Access 2007: Rich Client Solutions Overview of Access 2007 redesign, improvements, and new features. See the new WYSIWYG design experience and interactive report browse view and how you can use Access as a rich client for Windows SharePoint Services v3 and Office Live. Introduction to Upcoming SharePoint Products and Technologies An overview of the technologies that will release within Microsoft Windows SharePoint Services (version 3) and Microsoft Office SharePoint Server 2007, with a focus on specific developer opportunities. Powerful, Flexible Text-Formatting Solutions in SQL Server You can build very powerful and flexible text-formatting solutions in SQL Server. Learn how to apply techniques that handle the simplest to the more complex text-formatting tasks. SQL Server 2005's Undocumented Solution for Unattended Installs Automating installations with SQL Server 2000 is easy because it creates a setup.iss file that you can use as input, but Microsoft removed this feature from SQL Server 2005. Learn an undocumented SQL Server 2005 feature that provides similar functionality to setup.iss. Reap the Benefits of SQL Server's New Database Tuning Advisor The Database Tuning Advisor (DTA) is an improvement over the old Index Tuning Wizard. Learn how to access the advanced features of DTA from the command line with a custom configuration. The browser-based trial offers a real-time test drive and does not require product installation or download. With the test drive you can use sample data that you can edit, send by e-mail, and post to Microsoft SharePoint sites in real time. Outlook 2007 Add-in Templates Provide a basic template for developing Outlook 2007 add-ins using Visual Studio 2005. Outlook 2007 Add-In: Form Region Add-In The Outlook 2007 Form Region Add-ins are a learning tool that will help you understand how to design, build, and run custom form solutions based on Outlook form regions. Help Desk Sample Applications for SQL Server 2005 Express Edition and Visual Basic This Help Desk Sample Application is a rich client and web application that provides incident tracking and resolution administration. Survey Manager Sample Applications for SQL Server 2005 Express Edition and Visual Basic The Survey Manager Sample Application is a rich client and web application for managing a database of teachers, students, classes, and surveys. Walkthrough: Word 2007 XML Format Walk through the new default file format for Microsoft Office Word 2007. Read detailed descriptions of the file format architecture, key components, and ways in which you can programmatically modify content. Outlook 2007 Sample Add-ins: Rules Add-in, Travel Agency Add-in, and Prepare for Meeting Add-in Outlook 2007 introduces many enhancements to its object model that enable you to create richer solutions. Three sample add-ins, the Rules add-in, Travel Agency add-in, and Prepare for Meeting add-in are available in both Visual Basic .NET and C#. Code Security Changes in Outlook 2007 Microsoft Office Outlook 2007 enhances code security to help protect Outlook users against malicious code while reducing security warnings for developers and users. Isolating Microsoft Office Extensions with the COM Shim Wizard Learn about a set of new Microsoft Visual Studio 2005 wizards that automate the generation of COM shims for managed Microsoft Office extensions that do not use Microsoft Visual Studio 2005 Tools for the Microsoft Office System. 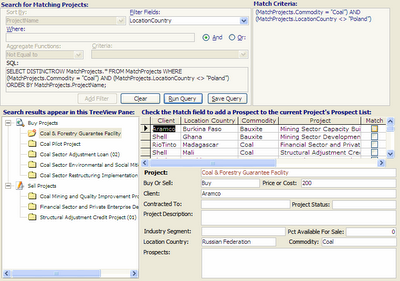 A new Access Database Application from aadconsulting.com: Matching Buyers with Sellers Project Matching. The July editions of APC and PC Authority magazines on the news-stands now, have the full Office 2007 Pro BETA 2 Install in their cover disks. Price of the mags is Aus$9.95. 10 common SQL Server problems and solutions, from TechRepublic - Downloads - TechRepublic This handy two-page list outlines 10 familiar SQL Server problems and solutions. 2007 Office System Sample: Open XML File Format Code Snippets for Visual Studio 2005 Download this package to install open XML file format code snippets for use with Visual Studio 2005. From DevX.com. Making Sense of the XML DataType in SQL Server 2005 In SQL Server 2005, XML becomes a first-class data type. Developers can make minor remote modifications to stored XML documents easily, taking advantage of new support for XML schema-based strong typing, and server-based XML data validation. The Office 2007 Ribbon feature now has its own portal at the MSDN Office Developer Center, where you will find technical articles, code samples, developer documentation, and multimedia presentations on customizing the RibbonX user interface in the 2007 Microsoft Office release. Microsoft provided all attendees with Office 2007 Beta 2, which replaces Office's familiar nested standard menus with a set of tabs and "ribbons". Microsoft claims this change—along with context-sensitivity that displays special functions when you select objects such as images, graphs, etc.—exposes more of Office's features to users. Perhaps so, but (at least in the beta) some of the features I commonly use weren't available from the ribbon, or at least, I haven't found them yet. For example, to run a Macro (formerly available through the Tools—>Macro—>Macros menu), you now have to first display the hidden-by-default "Developer" tab, a feature which is itself hidden under a button on the "Office" dropdown menu—which doesn't look like a menu at all. But other hidden features are welcome. For example Word Count is now always-available from the status bar. Despite some initial frustrations, I suspect I'll eventually like the new layout better. And, of course, it's both customizable and programmable. Better yet, it's programmable through configuration. By writing some relatively simple XML, you can add your own custom tabs and tools, or control the built-in features. For those Office developers who want to restrict users' actions, a single command called "StartFromScratch" removes all the built-in ribbon features. You can build from there, re-enabling the built-in commands and tools you want users to have, overriding their default actions with custom code, providing a completely custom set of tabs and tools, or giving them a mixture of any of these options. Users can even customize the ribbons you provide, creating their own preferred feature collections in exactly the same way they customize the built-in features. And this all works the same way across all the Office products. These three sample add-ins, are available in both C# and Visual Basic .NET versions, and demonstrate many of the new and enhanced features of the Outlook 2007 object model. Microsoft SQL Server 2005 Upgrade Technical Reference Guide contains guidance for SQL Server administrators, developers, and IT decision makers who want to move their SQL Server 2000 or 7.0 databases to SQL Server 2005. Increase confidence and reduce uncertainty about upgrading previous versions of SQL Server to SQL Server 2005. Lower upgrade risks by providing prescriptive, best-practices technical guidance about how to upgrade specific SQL Server features across all editions. Provide Microsoft partners and field representatives with appropriate SQL Server 2005 upgrade resources to serve customers. Section 1.0, “Upgrade Planning and Deployment,” provides a comprehensive overview of the key planning and deployment considerations for upgrading to SQL Server 2005. Sections 2.01-2.05 cover special upgrade considerations for high availability and very large databases (VLDB). Sections 3.01-3.08 cover upgrading relational databases to SQL Server 2005, including specific discussions on security, Transact-SQL queries, full-text catalogs, maintenance plans and SQL Server Agent jobs, Notification Services, Management Tools, and MSDE. Sections 4.01-4.03 then cover moving to the SQL Server 2005 business intelligence components: Reporting Services, Integration Services, and Analysis Services. See the appendices for detailed feature and edition comparisons and highlighted upgrade tips and tricks. SQL Server Everywhere Runtime Microsoft SQL Server 2005 Everywhere Edition CTP is a compact database for rapidly developing applications in both native and the managed environment that extend enterprise data management capabilities to desktop applications. SQL Server Everywhere is designed for developers who need lightweight, in process relational database solution for their applications that can be developed and deployed on desktop as well as on mobile devices. The SQL Server Everywhere CTP contains the runtime bits that can be used to develop and deploy applications on desktop only. SQL Server Everywhere is a powerful tool that makes it easy to develop desktop applications by supporting familiar SQL syntax and providing a development model and API consistent with SQL Server. See the ReadMe SQL Server Everywhere CTP Readme for more info. You can also download the SQL Server Everywhere CTP Books Online. To learn more about the SQL Server Everywhere CTP, refer to the “Community Technology Preview: SQL Server Everywhere” topic. SSMA for Access automates database migration from Access to SQL Server 2005. Microsoft SQL Server Migration Assistant (SSMA) for Access is a tool for migrating databases from Microsoft Access to Microsoft SQL Server 2005. SSMA for Access converts Access database objects to SQL Server database objects, loads those objects into SQL Server, and then migrates data from Access to SQL Server. SSMA for Access supports Access 97 - Access 2003 databases and is FREE! I have just launched Ezy Data Free Edition, a free lite version of Ezy Data 2000, the 5-star rated standalone database application. Users have access to over 40 table templates, and can create queries etc. Introducing the Microsoft Office 2007 Open XML File Formats Learn the benefits of the Microsoft Office (2007) Open XML Formats. "Users can exchange data between Office applications and enterprise systems using XML and ZIP technologies. Documents are universally accessible. And, you reduce the risk of damaged files." SQL Server Express: Using Data with Web Application Projects This white paper shows how to properly use SQL Server Express and Data Binding with Web Application Projects, an alternative Web project model that can be added to and used in Visual Studio 2005. Internet Explorer Favorites Sample Applications for SQL Server 2005 Express Edition and Visual Basic The Internet Explorer Favorites Sample Application is a web application for keeping track of browser history and Internet Explorer Favorites. SQL Server 2005 Upgrade Technical Reference Guide This 350-page document contains guidance for SQL Server administrators, developers, and IT decision makers who would like to move their SQL Server 2000 or 7.0 databases to SQL Server 2005. The Beta 2 version of the Microsoft Office Visio 2007 SDK contains sample applications, code snippets, documentation, and tools, including the ShapeStudio, Event Monitor, Persistent Events, Print ShapeSheet, and Solution Publishing tools. The Groove 2007 SDK (Beta) contains documentation, WSDL, and sample code for applications that use Groove Web Services. In addition, the SDK contains developer documentation for the Groove 2007 Forms and Groove 2007 InfoPath Forms tools. The 2007 release of the Microsoft Office system introduces custom task panes that give you the tools to put the features and information your customers need when and where they want them. Learn how you can use custom task panes in your applications. Read details about how to create document templates programmatically for Microsoft Office Word 2007, including information about using the new content controls, document building blocks, and XML mapping. Review some of the newest members of the Word 2007. Learn to customize the Document Inspector in 2007 Microsoft Office suites. Users now have one place to find metadata or hidden information in their documents and to take action. And, developers can create custom modules for special circumstances. Kimberly Tripp talks to us about improvements in SQL Server 2005 Service Pack 1, converting Oracle users to SQL Server, and much more. This article provides a high-level overview of new features for developers in Microsoft Office Word 2007 Beta 2. The article reviews content controls, XML mapping, document building blocks, the Word XML Format, and other new features. Two-part series introducing and explaining new features of interest to developers in Microsoft Office OneNote 2007. Developer-related features include a new COM API that offers new import, export, selection, and search function. These two articles cover the enhancements and additions for developers in Microsoft Office Outlook 2007. Part 2 is accompanied by the What's New Add-In, which is available as a download. Explore SharePoint Server 2007, which merges functionality of MCMS 2002 and SharePoint Portal Server 2003 with new functionality to create one integrated set of technologies built on Windows SharePoint Services V3. Explore the Microsoft Office Project Server 2007 functionality that uses a completely new platform built on the Microsoft .NET Framework 2.0 and Microsoft Windows SharePoint Services (version 3). Learn the benefits of the Microsoft Office (2007) Open XML Formats. Users can exchange data between Office applications and enterprise systems using XML and ZIP technologies. Documents are universally accessible. And, you reduce the risk of damaged files. Learn how to incorporate this control into your application, work with the XML data generated by the Form Control, and use IOLECommands to replicate functionality of the InfoPath 2007 form editing environment. Create a COM add-in for an application in the 2007 Microsoft Office release, such as Microsoft Office Publisher 2007, that extends the Office fixed-format export feature to support new formats. The technique described requires knowledge of C++ and COM. Read an overview of the user interface (UI) system for the 2007 release of the Microsoft Office applications and the goals behind the redesign of the UI. Learn about the impact of the redesigned UI on custom solutions and add-ins. Get a high-level overview of how Windows SharePoint Services (v3) implements the workflow capabilities of the Windows Workflow Foundation, and how SharePoint Server 2007 extends those capabilities with symmetrical InfoPath 2007 forms. Part 1 is the companion to the part-one article of the same name, and contains detailed reference material about the controls and method signatures for the Ribbon user interface, and a section of frequently asked questions. In Part 2Learn about the scenarios and XML markup that you can use to customize the Ribbon user interface (UI) in the 2007 Microsoft Office release. The Ribbon UI replaces menus, toolbars, and most of the task pane UI in the 2007 release. The ECM Starter Kit for 2007 Office System contains ECM feature extension code samples, supplemental developer white papers, and Microsoft® Visual Studio® project templates for workflow in Microsoft Office SharePoint® Server 2007 (Beta 2 version). SQL Server 2005 Express Edition with Advanced Services A new, free, easy-to use version of SQL Server Express that "includes more features and makes it easier than ever to start developing powerful data-driven applications for Web or local desktop development". Before you install SQL Server 2005 Service Pack 1 (SP1) or SQL Server 2005 SP1 Express editions and tools, review the readme for information about installing SP1 and to learn about common issues that can impact your installation experience or use of the product. Use with care! The property is not documented and therefore not supported by Microsoft. Go to the AccessWeb for detailed sample code.